Ken Aderholt was born in Harrold, Texas, and grew up on the state border, news channel 6 reported. Aderholt’s family has been running cattle on land near the Red River since 1941 and hoped to pass the land on to their children as it was passed on to them but the BLM has swooped in to take it and the reason why will stun you. The BLM says the boundary has moved and the 90,000 acres of private land is now theirs. 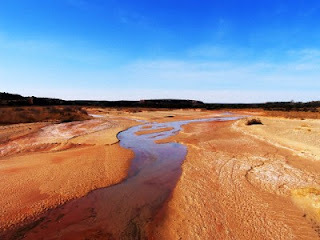 It affects, not only Mr. Aderholt, but all the famers and ranchers living along the Red River. It’s a complex case but the main point is that the BLM has decided to come in to steal 90,000 acres of private land in a 100 years old States' rights case. They won't pay a dime for it though the land has been in the families' hands for hundreds of years in some cases, they have deeds for it and they've always paid their taxes. They've committed no crimes. I interviewed one of the Red River land owners and he said he was losing all his valuable land except for 25 acres he bought in town and he was one of the lucky ones. Others are losing all their land or all their valuable land. 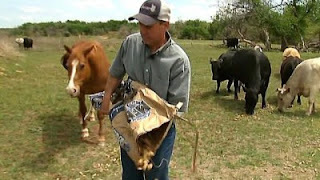 These are farmers and ranchers – the backbone of America! He told me that he knew something was up when the BLM was on their property surveying and testing for oil and other minerals. While the land is used for ranching, it is rich in minerals. The BLM is going back to the Louisiana Purchase and to two questionable 1930s and 1980s court cases which decided based on an interpretation of the 1803 Louisiana Purchase to steal this land which was in the families of some ranchers for hundreds of years. It involves missing surveys and promises from the government which are explained in more depth on the links below. The BLM contacted me to present their case but their case is inhumane, lacking in common sense and based on legal technicalities. I won't waste my time defending them. The BLM isn’t considering a quick, armed assault on these ranchers as they did with Cliven Bundy. Their plan is to drag these ranchers through costly and lengthy trials. They will bankrupt them and steal their land at the end. They have endless sums of money from tax dollars to drain these ranchers of funds. Right now, they aren’t even dealing with the farmers and offering to buy the land – they are assuming it is federal land. Listen to Mr. Chapman who hopes Americans will join him in his fight but Americans don’t seem to care about anything or anyone. It’s sad, no, it’s tragic, because we live in a country that is being fundamentally transformed into a socialist nation. The most fundamental of our rights is the right to own land and live out the American Dream, but it is over unless Americans begin to speak up. Private land ownership is the foundation of our free society and it sets us apart from the rest of the world but the Red River government land grab is a precedent-setting case that will forever alter the rights of private land owners and how we think about inheritance. 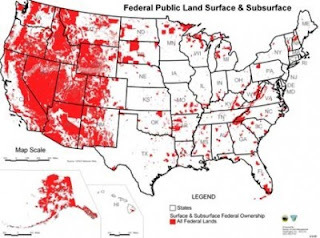 If the Bureau of Land Management (BLM) can take away the property rights of people who have owned the land for centuries in some cases, then no private land owner is safe in this country. Inheriting land will be a thing of the past whenever the government wields its pen with a new regulation or rule. The government has enough laws on the books and the power of the pen and phone to do anything it wants. The Bureau of Land Management under the leadership of Harry Reid’s friend and former colleague, Neil Kornz, has chosen to seize for the government roughly 90,000 acres of land that clearly belongs to private owners. The families affected have paid taxes on the property for centuries, at least one person since 1804. The BLM has decided to just take their land, claiming the government has always owned it and they never should have been given the deeds by the states. Outrageously, they will decide over the next year how they will use the land and if they will let the rightful owners use it on a lease basis. They are assuming the land is theirs. The BLM is claiming that the boundary, long defined as the vegetation line to the south of the Red River, has moved as the river moved. The BLM has an armed police force but they are not going in with AKs and in combat gear as they did in the Cliven Bundy case, they are taking a low-key approach though they started out differently until the case received publicity. If the government can invent any arbitrary reason to steal private property in the United States or go back to a case in 1803, no private land owner is safe. It gives the federal government unbridled power over our most sacred of rights upon which the foundation of our economy and prosperity is reliant – private land ownership. It is some of what drives men to achieve – the dream of land ownership. The land grab in Texas by the BLM will be the most egregious government land theft in our history. The government is stealing land that is unquestionably private because it can. They swooped in out of nowhere after hundreds of years of private ownership to steal it. The ranchers are on solid ground in this case – it is their land – but they will lose. Their is no clear reason as to why the BLM is doing this, but one thing is for certain, if these people don’t own the land, no one in this country owns their own land and the government can come in at any time and take it. This is going on throughout the West. They want more! The Constitution never meant for the Federal government to own the nation’s land in this way. I hope someone sets up a GoFundMe account with the provision that any funds remaining when the case is permanently closed and the ranchers have won goes to future Victims of the BLM power grab. discounts up to 80%, free shipping. This has nothing to dobwith justice, and in fact quite the opposite. They want tobset a precedent that helps to establish absolute power in administrative law and central government, over-riding every other law and precedent that might be a possible obstacle. These people are the equivalents of the intendants of Louis' XIV-XVI in France that were the instruments used to over power the local and provincial governments and systems of justice in France in the hundred and fifty years leading up to the French revolution. Uncle Sam has been grabbing land for decades: Did you know that 84% of Nevada is directly owned, managed, or regulated by at least one US Federal Government Agency? Socialism is the evil and destructive idea that society will really be more equitable when all are forced to live at the expense of each other. In pure socialism, there is no such thing as private property. In fact, you don't even own yourself. Government wants to even own your thoughts, and tries very hard to do that. Anyone who is familiar with the Bible should see how socialism must violate the Commandments that forbid coveting and theft. The very idea that society will be better off is a blatant lie. The Apostle Paul said (Ephesians 5:5) that coveting had the effect as the worship of idols, that is to say, it is the worship of a false god. He also wrote at the end of Romans chapter 1 that people who practice covetousness and idolatry are worthy of death as well as those who approve of them doing so. In Revelation 22, Jesus says that such people cannot inherit eternal life. So even Jesus tells us enough so we should know that socialism brings evil in this life and spiritual death to anyone who support it.